» […] during the infusion, we found a bubble in the infusion tube. For safety, we have to stop the infusion and expel the bubble in the infusion tube, and this stop takes 5min. And to complete the infusion in 0.5h, we speed up the infusion pump speed. Be aware that the dose will not be correct since likely you lost a part by flushing the tube. Whether this is really relevant depends on the lost volume / total infusion volume. » We will assessment the PK for this drug by NCA. What's the effect of this situation? Does the Cmax should be excluded? What about the AUC? What should the investigator to do if the same situation (need to stop temporarily or need to change the infusion speed) occurs next time? 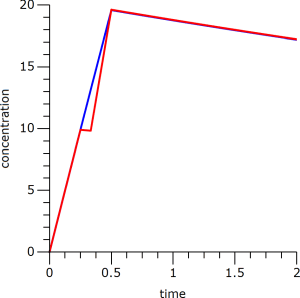 only if you lost nothing (almost impossible) the Cmax and AUC will equal the one with a constant rate infusion. I don’t see a solution if you will analyze the data by NCA. If you are able to measure the lost volume, you could analyze the data by a PK model correcting the doses and adjusting the infusion rates. Example: t½ 8 h, infusion interrupted after 15 min for 5 minutes, adjusted infusion rate, no dose lost.